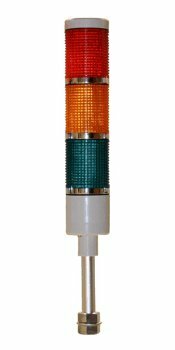 52mm Indoor Red, Yellow, Green Andon Light. 24VDC Steady operation. Light. Wiring is switched +24VDC with -Ground as common and the light pulls less than 4 watts per color.Continuous activated light is ideal for devices that want solid light state activation OR have the ability to pulse output from the controlling device. Great tool for any warehouse, factory floor, lab or facility needing visual notification or status at a glance.